Censoring ‘anti-government’ content online is not a new thing. Activists, journalists, free thinkers, rationalists have faced a ‘blockage’ every time they have expressed their views on social media platforms. Either their social media pages are brought down or they just start featuring less and less on people’s timelines. An internal company briefing produced by Google and accessed by Breitbart News argues that due to a variety of factors, including the election of President Trump, the “American tradition” of free speech on the internet is no longer viable. 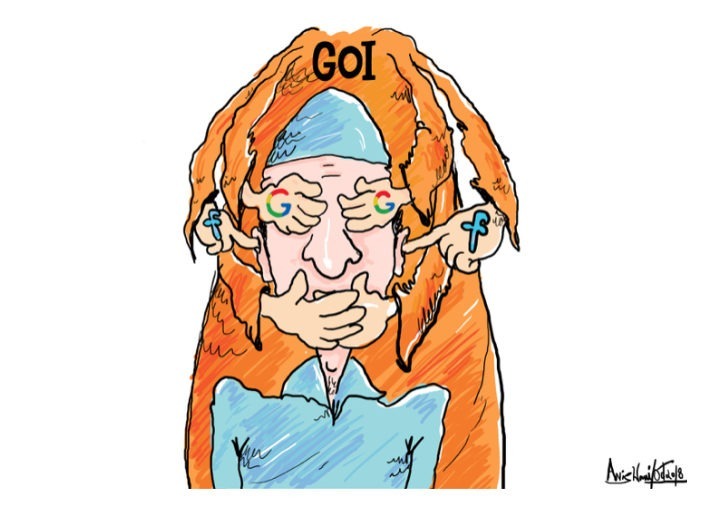 The briefing titled the ‘Good Censor’, admits that Google and other tech platforms now “control the majority of online conversations” and have undertaken a “shift towards censorship” in response to unwelcome political events around the world. The report also mentions that ‘online political interference is on the increase’. Facebook censoring Kashmir related content and profiles is not new. Facebook had censored dozens of posts and user accounts in 2016. Academics, journalists and the pages of local newspapers are among those who have had photos, videos and entire accounts deleted by Facebook after they posted about recent events in Kashmir. Professor Dibyesh Anand of London’s Westminster University said his posts about the actions of Indian armed forces, which have drawn criticism for their heavy-handed tactics, were removed more than twice. Mary Scully was censored in 2016 too. Scully had told The Daily Mail that her posts were also removed on more than one occasion, citing community standards. She and Anand along with others had started a petition urging Facebook to investigate. Not only people, organisations have been censored as well. In July 2017, Kashmir Ink, which is a sister publication of the leading Kashmiri newspaper Greater Kashmir, found its Facebook page blocked when it did a cover story ‘Kashmir: A year after Burhan’s death’, on the anniversary of the killing of Kashmiri militant leader Burhan Wani. To read the whole leaked document, click here.